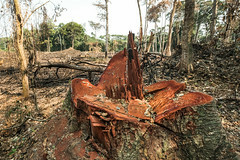 STOCKHOLM – Tax havens are facilitating deforestation and illegal fishing but allowing the perpetrators to hide from taxes and legal repercussions. On August 13th the Stockholm Resilience Centre issued a public release which details the results of research on the link between tax havens and illegal fishing and deforestation. The researchers found that approximately 70 per cent of all vessels which are known to have been involved with illegal, unreported, or unregulated fishing around the world were flagged and registered in jurisdictions widely recognized as being tax havens. In many cases, the jurisdictions in which the fishing vessels are registered are not known to routinely prosecute or penalize vessels which are found to be in breach of international maritime laws. Further, the researchers found that 68 per cent of foreign capital which was moved to sectors and businesses involved in deforestation in Brazil was transferred via companies registered in tax havens. The study showed that approximately USD 26.9 billion of foreign capital flowed to firms involved with deforestation, and USD 18.4 billion of that came from tax havens. The most popular jurisdiction among those counted as tax havens was the Cayman Islands. As a result of the study, the researchers are calling for the tax benefits and legal shelter provided to these companies to be labelled as indirect subsidies.